This is a beautifully designed and built item. Clearly someone put a lot of thought into it. Judging by the support on kickstarter - it made its goal and added a stretch goal - people think it is a great idea. I don't mean to knock a great looking piece of gear. But this is completely unnecessary. First, what is the outdoor industries obsession with bottle openers? Most yakima products have integrated bottle openers. A few years ago their was a sandal with a bottle opener in the sole. Every multitool, and a lot of knives have them. The knife on my PFD has one! Do we really need another bottle opener? It's a key chain. I have a key chain. thanks though. You can use it to secure gear when used in conjunction with paracord (America's obsession with paracord is another blog post!) which means I probably need more than one of these. You know what else can secure gear with paracord? a knot. The truckers hitch from Paddling Otaku on Vimeo. No additional gear needed. I haven't timed it yet, but I think that I tie this truckers hitch faster than he uses his bottle board. Really, I don't mean to knock this product. I think it is much nicer than this, and clearly a lot of thought went into it. But I would like to see this clearly talented person putting his effort into something we actually need. Something else to consider, I am in the minority on this, since it has gotten funded, people seem to like this sort of thing. Cue David Letterman, not really. These are my top ten posts - in no real order, with a couple of edits. I am not going to include Christmas related posts - more on that towards the end. #10 A kind of angry social media post. Written almost two years ago, I think a lot of the comments are still valid. Feel free to respond in the comments with your own suggestions. #9 I think the most important post I have ever written, and it is close to the most read post I have ever posted. Send it around to your friends who paddle. I love that if you google the topic this post comes up first, though as a Buddhist I should try and separate out the ego? Shouldn't I? #8 Eerily similar to #10, I am a little angry that a certain product doesn't exist. #7 Encounters of the furry (and toothy) kind, and the lengthened version at Let's be Wild. #6 My beloved. Well, my non-wife beloved. #5 The ultimate stove workaround. #4 It's always best to start at the beginning. #3 March 23rd 2010, it all started with this. I still think the most overlooked post, that the most people struggle with. I could write an entire book on this topic, wait a minute, I am! It will be done soon. #2 So much debate. When it is really so simple. This is a really good, fair and balanced view from a group that know a thing or two about the topic. #1 This really is my single most viewed post. Go figure. Everyone does it. Finally, as I mentioned at the top, I didn't include my Christmas related posts. On one level I am not surprised that essentially a shopping list post is very popular, but as a bit of a minimalist I saddens me that this is what a lot of people are most interested in. But with my mind on fairness, here are two very popular Christmas related posts. The student that bought the Cetus HV was of course also shopping for a paddle. When he went down to Charleston he was very focused on the boat, and thought very little about the paddle, though he did use a Werner Kalliste. He had been debating bent shaft versus straight shaft, but when he was talking with the people in Charleston they were telling him that he should be doing a high angle stroke in a boat like that. I should point out for clarity that this particular student is planning an expedition on the Yukon, which I am advising him on as well. But the Bent versus straight and High angle versus low are the two topics that I think confuse people the most. So that is todays topic. Low Angle is the most common paddling style. It is a more relaxed touring style and relaxed cadence. Our Low Angle designs have longer and narrower blades designed to pull through each stroke with the right amount of surface area for good power while maintaining a smooth forward stroke. 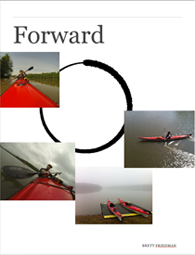 High Angle paddling is typically a more aggressive style of paddling with a faster cadence and a larger variety of strokes being used on each paddle outing. Our high angle designs have short wide blades for a powerful catch and stroke with a slight dihedral for smooth linking strokes. When I read that some key phrases stick with me for Low angle: relaxed, relaxed, smooth. And here is what sticks with me for High angle: Aggressive, Faster, powerful. If you were paddling 600 miles of the yukon, or 350 miles of coast, which of those do you think would be better? I teach a low angle style, which is not to say that there aren't times that I work into a high angle style for a couple of strokes at a time. Breaking through an eddy for instance, or getting out of the surf zone. High angle style calls for a shorter paddle, low angle slightly longer. It is easier to use a low angle paddle length doing a couple of high angle strokes than the other way around. Low angle generally calls for a smaller blade, larger for high angle. Here is another way to think about the two. High angle equals fewer strokes and more effort for explosive speed. Low angle equals more strokes but easier work for a smoother, more continuous speed. High angle is a more whitewater/racing style of stroke. The blade will move down the side of the boat in a straighter line so you can focus all of your energy on speed. Low angle means the paddle is doing more of an arc, so you will be working less, but correcting direction more often. So here is how I break it down. Touring, or recreational paddling you probably want to or are, a low angle paddler. 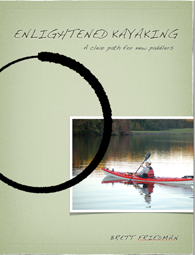 Whitewater, racing, rock gardening or playing in surf and you are probably, or should be a high angle paddler. As to why the people helping my student in Charleston thought he should be using a high angle style? I have no idea. Back in the dark ages when I learned to paddle (okay, 1996 is when I got serious) I went to a kayak festival/symposium in New Jersey. I went to each manufacturer and said "I am a narrow hipped person who wants a boat for long distance touring, what do you have that will work" and each time I was shown a high end touring kayak, generally the top of that particular manufacturers line. I went to the Werner rep and said "long distance touring, fit me for a paddle" what I ended up with was a werner camano with carbon shaft and carbon blades at the 220 length. I asked - what? no bent shaft? and the rep said 'nope'. In 1996 bent shaft was strictly a white water paddle, and really only slalom racing. I guess in the early 2000's bent shaft paddles started sliding into touring. We were then told that the bend in the shaft would prevent injuries to wrists and elbows. In my opinion - and this is horribly negative of me - I think this is a way to sell a higher priced product to people that don't need it. I know a number of people who say the bent shaft is easier on pre-existing injuries in their wrists. So like I have said on many topics, if it works for you do it, but if you are paddling correctly there should be little or no movement of your wrists or elbows anyway. For me, these are the deal breakers on bent shaft. The bend makes the shaft weaker, so to get the same strength you need a heavier shaft. By adding a bend to get the same 220 length you have to make the shaft longer, which is also going to make it heavier. The Werner Kalliste bent shaft weighs 3 ounces more than the straight shaft. Three ounces doesn't sound like a lot, but over four hours of paddling that is about 3000 pounds you don't have to lift. At the end of the day weight wins over everything else. Werner does say that the bent shaft gives you more contact with the paddle, which can give you a more relaxed grip. they also say it is easier to tell the proper orientation of your paddle without looking. Both excellent points, and as I said before, if it works for you, go for it. Werner paddles offers a great fit guide on their website - that today would put me in a 215 cm paddle versus a 220 that the rep put me in 21 years ago! I think paddle lengths are like skirt lengths (women's skirts, not spray skirts) and they change with the times. Epic paddles offers the history of the bent shaft, which is a fascinating read. If you want to see how to do a high angle stroke, the lesson is here. It is a little odd, the number of different boats I have paddled in the past few weeks. It is mostly due to a student who was putting a lot of thought into the boat he wanted to buy. Really a lot of thought. Because of that I was making as many boats as possible available for him to paddle, and the by-product of that was I got to paddle them all as well. I really enjoyed the time I spent with the Valley Etain. 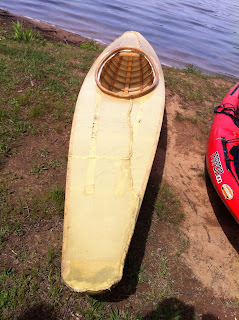 Last week I paddled - but didn't review - the perception Essence in airelite. Really nice boat, and I got a photo of myself that I like, it now adorns my facebook page header. He paddled my Delta and a couple of other Delta's I have access to. This past weekend he drove down to Charleston to look at boats, and though he invited me, I couldn't make it. And he was nice enough to let me paddle it. I want to start with the things I didn't like. I felt like I was sitting very high in the water. This seems like a little thing I would probably get used to. At the back of the seat there was a small bump that was hitting me in a way that would be trouble if I was paddling for several hours. 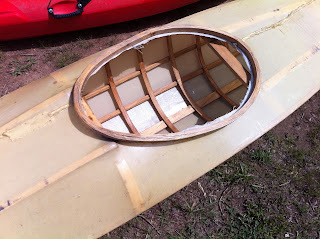 Despite the fact that this was the HV (High Volume, my friend is much taller than I am) it fit me pretty well, but when I edged the kayak my knees were hitting unpadded fiberglass. The hatches covers were basic rubber, that would concern me over the course of years I would expect to own a boat of this nature. It had four hatches. A bow and stern of course, a front day hatch which is becoming standard - this one was quite nice, and large, yet also up and out of the way inside the cockpit!) but it had a day hatch behind the cockpit. Of course bulkheaded. For the life of me I don't understand this! It is so hard to get things into the small hatch opening.... I just don't get it. These aft day hatches are becoming very popular, yet you can't really access them while paddling, they make the largest compartment in the boat harder to pack, the openings are so small you can't put anything of size into them. Someone explain this to me. Okay, that's what I didn't like. You want to know what I liked? Everything else. This was a gorgeous kayak. Beautifully made with amazing attention to detail. The finish was superb and on the inside the construction was solid, with no bare edges, or odd leftovers. Getting into the boat was easy - despite my short legs, and its high deck I had no problem getting in or out - though I am pretty flexible. The seat - with the exception of the piece in the back - was comfortable and held me snug, with out being obtrusive. Loved the hip pads on the sides, I will be adding something like this to my boat. It has a nice low back deck, and I am sure rolling it is a breeze. Performance wise, its rounded chines move onto edge easily, but it does take a little work to hold an edge. It tracks beautifully without the skeg down, and with just a little edge it turns well for a boat of its length, almost 18 feet long. I felt at home in this boat much faster than I did in the Valley Etain. With a little effort I got the boat moving and then was amazed at how fast it felt. This is truly one of the most enjoyable paddling experiences I have ever had, and that is a bold statement. I have paddled a lot of boats. So could this replace my trusted and loved Delta? In a word, no. Here is why. Despite its longer length, and HV name, it can't handle as much gear as my Delta. It would be hard to fit a months worth of food/fuel/gear inside her. She weighs right around 10 pounds heavier - we could have a long debate about strength/rigidity between the two very different boats - but here is the deal killer for me. If I had an extra $4000 lying about I would do it in a second. The cetus is almost double the price of my Delta. So, one of the nicest boats I have paddled, but way out of my price range. But this is a four star boat, and It was a joy to paddle. Oddly, as we were packing up our boats to call it a day, something you don't normally see pulled up. That is a hand made, skin on frame boat. The gentleman that built it didn't even build it from a kit. I think from what he said, he has two others and is working on a third. Total cost? Under $100 in materials. Quite the contrast, we had nearly $6000 in boats next to this one. Proving again it isn't the cost of the boat the determines its value. It is how much fun you have in it! If you follow me on Social Media, you probably know that I am an instructor with NOLS Wilderness Medicine. Because of that I spend a lot of time talking to people about first aid kits. 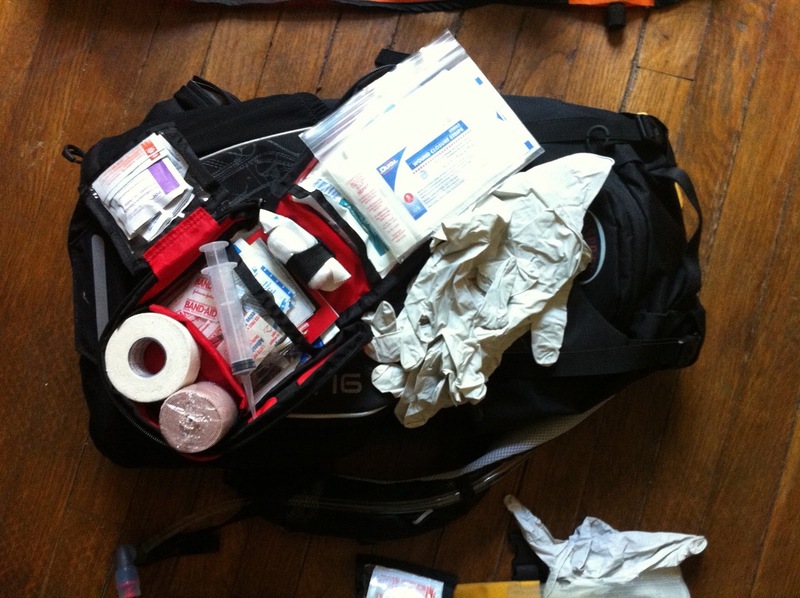 If you read this blog regularly you know about my mishap a few years ago and the fact that I didn't have a first aid kit in my boat when I needed it. 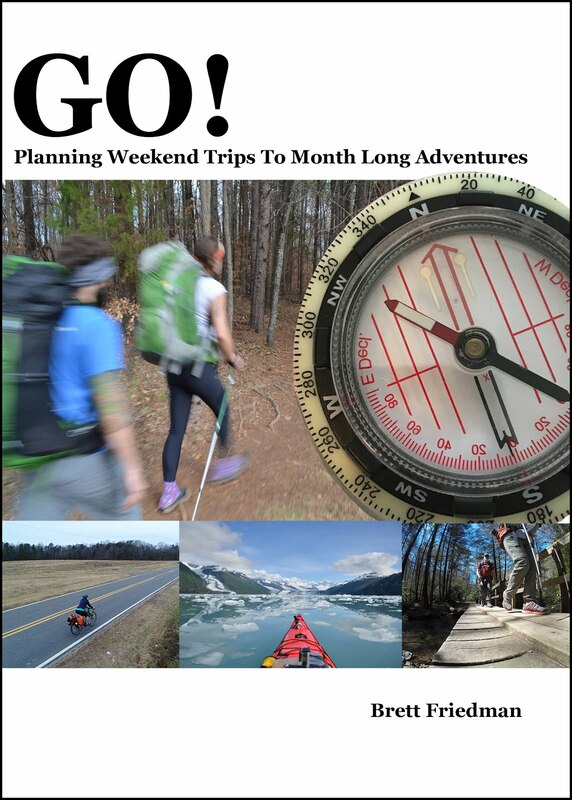 Since then I have changed a few things, and with the addition of mountain biking to my list of regular activities, I needed to add a couple of things. I have always been a fan of the theory that the bigger your first aid kit, the less likely you are to need it. This is a theory that has worked well for me. I use a 15 liter dry bag as my first aid kit when paddling. It lives in front of my feet in the cockpit, so it is easy to get too. Only when it was out of reach did I need it. Frequently people tell me they just want to buy an empty kit, and they will fill it themselves. This is a mistake. No matter which brand first aid kit you buy, the manufacturer buys the contents to the kit in bulk, so I can get them at dramatically reduced prices. Far cheaper than an individual can get the needed pieces, unless they work in a hospital or some other job where they have easy access, and little oversight - if you know what I mean. So I recommend that people buy a first aid kit, then remove the things they wont ever use, and add the things they will. Things to remove are SAM splint knock offs that don't have any rubber coating, as well as ridiculously small rolls of tape and ace wraps. I really like this little HART First Aid Kit, though there are many good options. I have yet to find one that comes in a dry bag. I don't like the idea of moving the kit around with me as I change activities. So when I started mountain biking I bought another little kit, and added it to the hydration pack I was using for cycling. I have the identical kit in my deck/lap bag when I kayak. 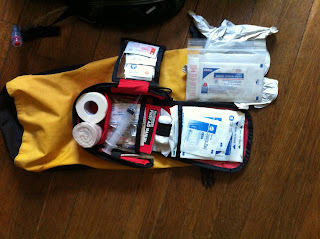 I then have my large 'expedition' kit in the trunk of my car, which comes with me on multi-day trips. This is the kit that goes with me on day trips. I have added to it two pairs of nitrile gloves. A NOLS wound pack (which is the best 5 dollars you will ever spend) I got rid of the small roll of tape that comes with the kit and replaced it with a full size roll of athletic tape. I also added an irrigation syringe, A full size ACE wrap, Band aids and 4x4 gauze. Roller gauze, and a small pair of trauma shears. In the yellow bag I have things like sunblock, and powerfood, chap stick. a light source, etc. This is the exact same kit in my hydration pack. With the exact same additions and subtractions. I don't have to think about what is where, and what the kit contains. it is just ready to go. 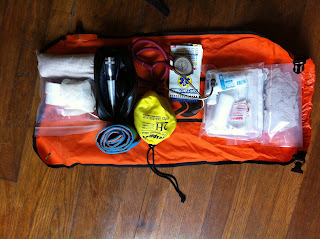 and finally, my expedition bag. On the left, in a ziploc bag, a large ace bandage, a triangular bandage and two rolls of tape. Next to it - rolled up - is a large SAM splint. I think of this as 'musculoskeletal'. Gear for dealing with a sprain/strain or fracture. All the way to the right I have another ziploc, this is filled with roller gauze, an assortment of bandages 2x2, 4x4 and bigger, NOLS wound packs, tincture of benzoine, band aids, irrigation syringe. Nitrile gloves, Trauma shears, and tweezers. I think of this as 'Trauma'. Materials for dealing with any sort of traumatic injury. Laceration, punctures, avulsions, burns. you name it. In the middle is a small black bag with a BP cuff and mini maglight. A Littman lightweight stethoscope. A CPR shield and an ALS field guide - the one I carried when I was a medic. Before an expedition I will add medications to the big kit. Here are things I don't carry. No quick clot, or commercial tourniquet products. Unless you are in a war zone you won't need them, and I have heard very contradictory information of how well quick clot works. No sutures. First, you probably wont need them, second, in the back country sutures can cause more trouble than they are worth. Without a local anesthetic they are painful to use. If the wound gets infected you have to cut them out, clean the wound and re-suture. The WMI wound pack carries steri-strips that when paired with tincture of benzoine and a transparent semi-permeable dressing works better, and is more field maintainable. I am fanatical about gloves. I buy expensive (When I say expensive, it is only in comparison to cheap gloves, I pay about $15 for a box of 100) nitrile gloves that fit me really well. This way I can actually do things with them on. I don't care what people say, you can improvise a lot of things, but not gloves. The most important piece of gear I carry however, isn't in any of these kits. It is what I have learned over many years. First as WFR, then an EMT-BASIC. Then I worked as an EMT while I studied to get my Paramedic, but honestly after all of that training, and work, my wilderness medicine skills really got hammered home when I became a NOLS Wilderness Medicine instructor. NOLS refined my skills and made me a better practitioner, and a better teacher. I highly recommend that you take a wilderness medicine course. Much like my theory on first aid kits, I think the better you are trained the less likely you are to need it. Or at least that is my hope.